Shruti and Roshan had an arranged marriage but the moment we looked at their wedding pictures, it seemed like they'd been in love all along! Destiny always has its way, I suppose. The typical arranged marriage scene happened in Mumbai. Shruti, who was born and brought up in Ludhiana, never thought that she would ever settle down in a fast-paced city like this one. Opposite interests, opposite habits and different lifestyles, the two couldn’t be further apart but the one common thing they shared is the immense love for their families and that is what made them believe that that LOVE indeed would always help them overcome all the differences. And so they decided to tie the knot only after a few planned meetings. Shruti and Roshan’s pre-wedding shoot was captured by the team at The Wedding Salad at Vasai Fort, Mumbai. The old-worldly charm of the location was rather beautiful. Shruti looked casually pretty in a purple, box-pleated C-cut skirt and a colourful floral printed top. Roshan carried off a pink formal shirt effortlessly. We loved how though it was an arranged marriage, the love that was present was unmistakable. The groom’s unusual, regal outfit stole the show! Roshan donned a contemporary-yet-ethnic ensemble with interesting drapes which he paired with a matching velvet jacket with gold work and a stunning neckpiece. Shruti looked no less beautiful in a pink and white anarkali with embroidery and a mirror-worked border which she styled with a sheer dupatta. The naach-gaana, fun and festive mood at the event held at Radisson Blu Ludhiana truly made it a night to remember. Shruti had never wish for a big fat wedding. She only wanted it to be beautiful. But her stars seemed to shine brightly upon as she was blessed with a mixture of both. The wedding took place at Whistling Woods, Ludhiana with all the pomp and splendour that you would expect out of an Indian wedding. Everything was planned with personal supervision without any professional planners involved and Shruti’s big joint family left no stone unturned to make it the most memorable time of her life. The groom, Roshan once again, looked dashing in a gold and white ensemble, accessorizing with a red dupatta, matching safa and jade neck-piece that had a regal air about it. 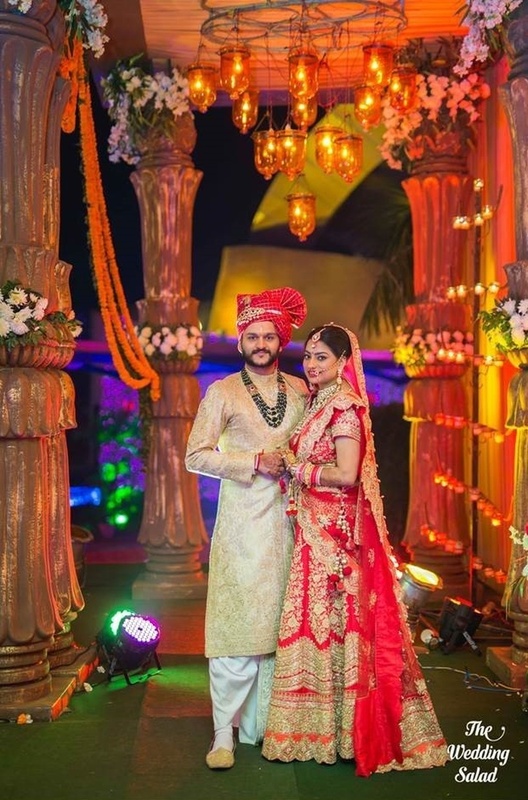 The bride graced the event in a traditional red and gold, heavily embroidered lehenga. Her gorgeous polki neckpiece is what caught our eyes. The decorators at Ferns and Petals did a fabulous job of beautifying the venue.